The daughter of a British man due to be executed in China for drug smuggling has said her father was "mentally ill" and deserved to be spared. Leila Horsnell said her father Akmal Shaikh, 53, from London, had always behaved in "extreme" ways. Mr Shaikh has denied knowledge of the 4kg of heroin found with him in 2007. Gordon Brown has called for clemency but Mr Shaikh's final appeal was turned down this week and he is due to be executed on 29 December. His defence team has said Mr Shaikh suffers from bipolar disorder and did not know what he was doing. They say he was duped by a criminal gang into carrying a suitcase that did not belong to him. His daughter said he was approached by drug smugglers in Poland and they convinced him they would make him a popstar in China. "They recorded a song, and he can't sing, and the song itself is very very bizarre, but they convinced him that they're going to take him to the clubs in China and make him a huge popstar," said Ms Horsnell. "He just believed he could do anything, and he could achieve anything, and if somebody had said to him that he could become a popstar, I believe he genuinely thought that." She told BBC Radio 4's Today programme there were "a lot of different sides" to her "charismatic" and "delusional" father. "There would be times he would have extravagant ideas, he could open an airline," she added. "Then there were times when he would be extremely religious and wanting us to lead a secluded life." She insisted her father would never do anything criminal willingly and called on the Chinese authorities to take his mental health problems into account. 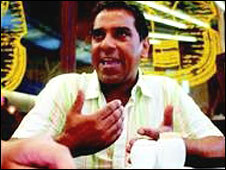 Mr Shaikh was arrested in September 2007 in Urumqi, north-west China. The Chinese foreign ministry said the "grave crime" had been handled in accordance with the law. China's Supreme People's Court denied his final appeal on Monday. He is set to become the first EU national to be executed in China in 50 years. Chinese death penalty expert Professor Christopher Stone told the BBC the death sentence was "heavily used" in China but the exact figures were a "state secret". Prof Stone, of Harvard University, said estimates over the past five years reached a height of about 10,000 death sentences a year, but a "genuine reform process" had brought the figures down. He said death sentences were handed down for various crimes including murder, corruption and drug trafficking. The death sentence was "hugely popular" in China and had the support of between 80-95% of the population, he said. Prof Stone said the authorities would not want to be seen to make an exception for a foreign man but the issue of mental illness was an important consideration in Chinese law. "The Chinese law is actually pretty careful about mental health issues," he said. "They have special dispensations, special rights, greater right to counsel. "In this case, the issue of mental illness seems not to have been raised until after the trial was over and the death sentence had been handed down." Jonathan Fenby, China director at the research service Trusted Sources, said the chances of a reprieve were "small" and there was a "whole pattern at the moment" of China playing "things fairly tough". "China does not react well usually to pressure from outside," he said. "The Chinese would see this as an interference with their internal affairs, which is the thing they are most resistant to." Amnesty International counted 1,700 executions last year, he said, but about 6,000 prisoners were actually condemned to death, with many sentences suspended for several years. "If they are thought to have behaved themselves or ingratiated themselves in various ways with the authorities, the execution is not carried out but that's usually in semi-political cases," he said. Reprieve, which campaigns for fair trials and promotes human rights, has been working with Mr Shaikh and his legal team. It has called on the prime minister to "speak directly" to the Chinese president. A Downing Street spokesman said on Tuesday: "The prime minister and foreign secretary have raised Akmal Shaikh's case with China's leaders on many occasions. "Yesterday the prime minister wrote to express his dismay that Akmal Shaikh's sentence has been upheld by the Supreme People's Court."